Lu par : Don Colasurd Jr. 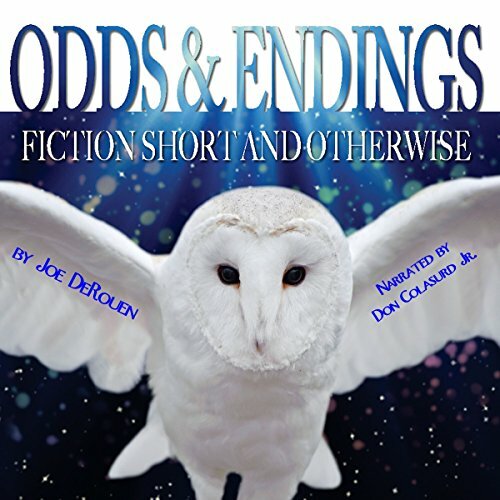 Odds and Endings: Fiction Short and Otherwise is Joe DeRouen's first short story collection, and contains 13 all-new tales of magic, murder, and mystery. The compilation includes one novella and 11 short stories, one of which takes place in the Small Things universe and involves some of your favorite characters. In "A Stranger with Your Hair", we meet Parker McCain, a womanizer who's always looking for the perfect partner. He gets all that and more when he makes a certain wish. Speaking of wishes, "The Wish" shows exactly why you should be very careful when you hold someone's heart in your hands, while "Mommy's Favorite" illustrates what can happen when a mother's love goes too far. And in "Merryland", we'll spend time with Zara Boone, a woman who gets far more than she bargained for when she inherits her dead grandmother's house. These are just a few of the tales that await you in Odds and Endings! I would say it was worth listening to. I enjoyed how the stories were all vastly different and covered fantasy to horror; although, the horror ones were very well done. It felt very much like I was listening to Tales from the Darkside or Tales from the Crypt or Twilight Zone. What was one of the most memorable moments of Odds and Endings? I could point out many moments in the stories; but, my favorite one was "Going Over" solely because it brought me back to my childhood. Any story that includes Rowdy Roddy Piper is a good one. Add more inflection. I felt that some moments were lost due to his deep tone. Was Odds and Endings worth the listening time? Yes, the stories were fun to listen to and I enjoyed the "Shyamalan" twists. I would listen to more shorts by this author. I did not realize this was a collection of short horror/mystery stories until I reached the conclusion of the first story and my mouth fell open. I normally don't read this genre and one story after another left me dumbfounded. Mommy's Favorite was way over my head and I read/listened to it a few times but still did no understand the conclusion. Saying these stories are creepy are an understatement. If you like Stephen king's movies you will enjoy these collection of stories. The narrator was ok but there were some background noises going on behind some of the stories. Not sure if I was the only one that noticed it. I found it a bit distracting. I think the narrator could have used more inflection and pauses between stories. This is a good collection of stories and I enjoyed it quite a lot. I thought that perhaps since I had not read the other Joe DeRouen stories in this universe that I'd be a little lost but that was not the case. It has an early Stephen King feel to it. The narrator was good, his friendly voice lulled my right in. The editing was a little tight - it would have benefited from longer pauses between paragraphs and sections. All in all I recommend it without reservation. I'm a huge short story lover and this book has several. Each is a suspenseful tale with a few twists and turns. I love shorts because I can listen or read them during breaks but it takes a talented author to bring a story down to the most important information without jumping too quickly or giving anything away too soon. I think Jake DeRouen has the ability to do this. I'm not sold on the narrator. He wasn't great but not horrible. What I did really dislike about the book was each story flowed with little separation between them. I think there should be larger pauses between them and a little more intro so the reader knows the story is switching. Otherwise it's an entertaining collection of shorts.